How exactly do I go about translating Pass languages? How many languages can I add to a Pass? You can add as many languages as you like from the drop down list. When the pass is downloaded onto your customers’ smartphone device, the pass will determine the default language of the phone and apply the relevant local text translation. You will need to click on the languages tab in the pass designer. 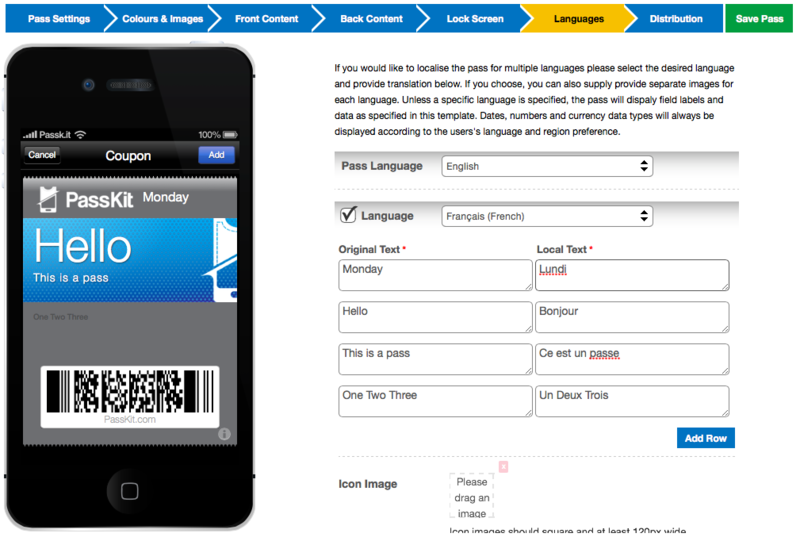 Select the language you have used to design the pass under the ‘Pass Language’ tab. For the example we have created the pass in English. Tick the Language checkbox and select the language you want to translate to. For this example we are translating into French. Copy & paste every string of words that appear on your pass into the original text column, including wording on the front and back of the pass, make sure you’ve accounted for everything! Enter the translated version into the ‘local text’ column. If you are adding more than one language select the ‘add language’ at the bottom of the page and repeat steps 3-5.